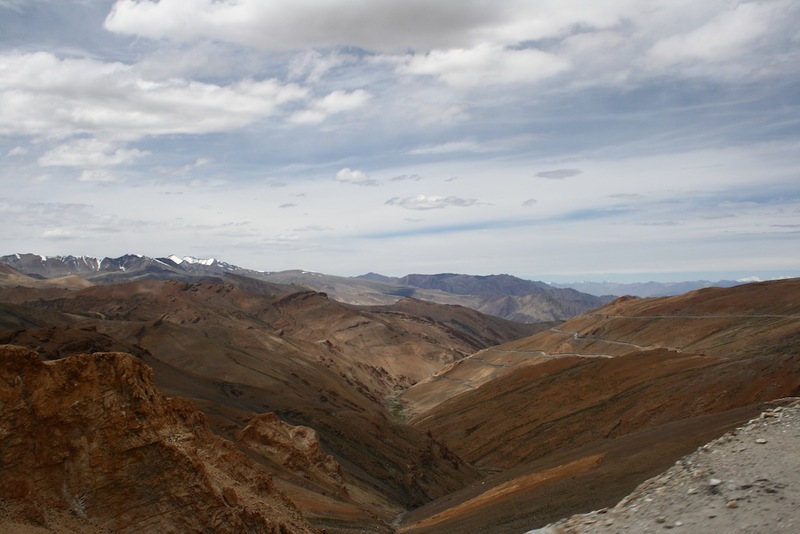 Leh emerged in my travel radar around 3-4 years back when I started hearing about friends and colleagues visiting. 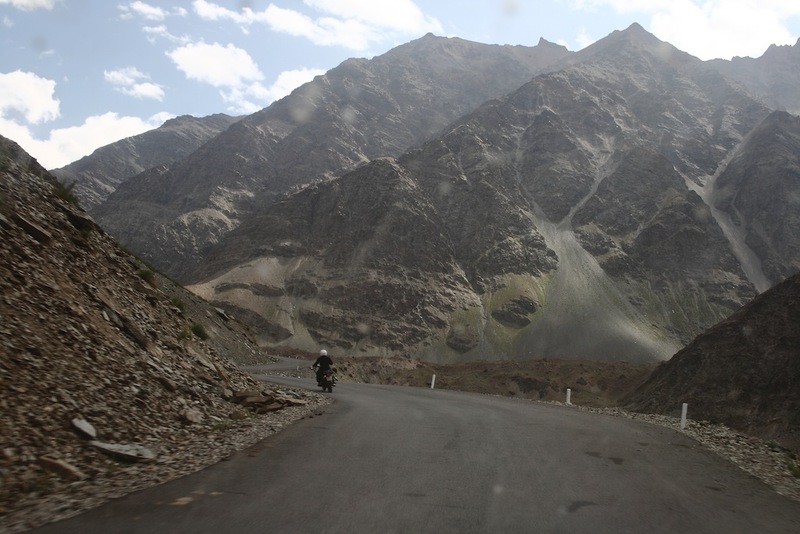 Many were flying till Leh and hiring cabs to go around there, but some also rode bikes to Leh. One person I knew had once sent his bike from Bangalore all the way till Delhi to ride it to Leh. 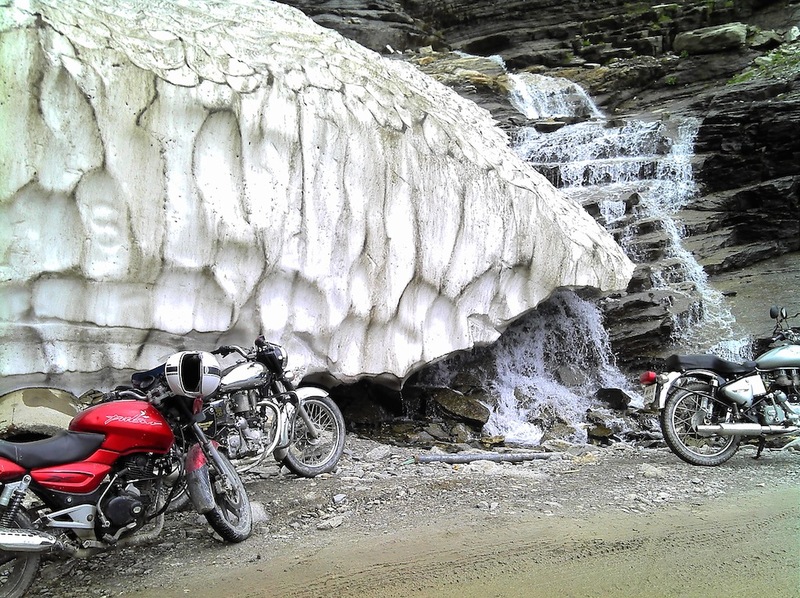 Last year another person went riding from Manali to Leh and was absolutely smitten by the trip. The bikers mostly spoke about the bike ride. The non bikers displayed their photographs, which were also impressive. I liked traveling, but I've never really been a 'biker'. My perspective here will instead be of someone who also enjoys riding among many other things. 4 bikes - 500cc RE x 1, 350cc RE x 2, 180cc Pulsar x 1. From Anu Auto Works at Manali. Friendly people. Good mechanics. Trouble free bikes, though not in the best condition. We didn't take the packaged trips, just the bikes. Charges per day: Rs.1200 for 500cc RE, Rs.1000 for 350cc RE and Rs.900 for Pulsar, Rs.1500 for a mechanic. Pay 50% advance to reserve, remaining on pickup. Bike drop off at Leh costs Rs.5000 per bike. If not taking mechanic, pay security deposit Rs.10000 per bike and collect it on return. One car (Innova). A few of us did not want to ride bikes, so we also booked a 4-wheeler for them. 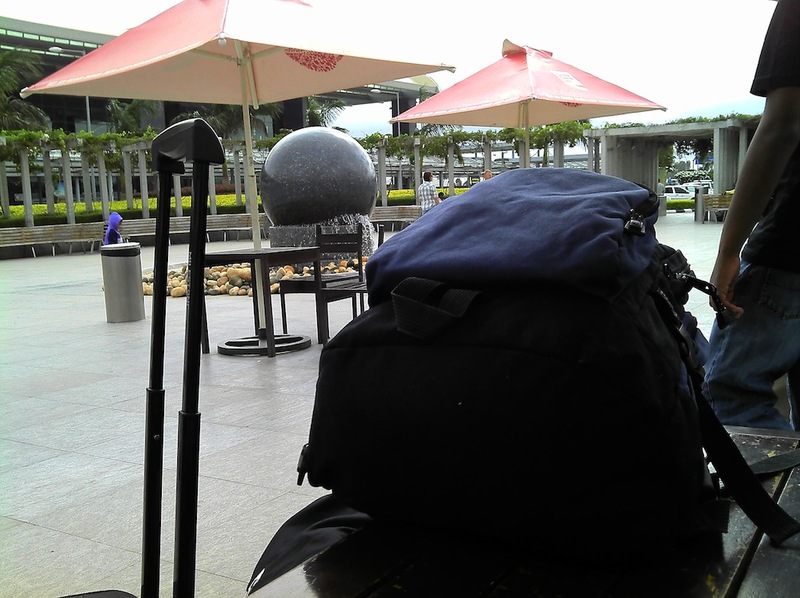 It would also help us carry luggage, and for us first timers be a safety net. Cost Rs.17000 for 4 days. Rain coat, jacket, waterproof gloves, balaclava: picked up from Bangalore (commercial street and cramster). Rubber boots, medicines, small oxygen can, fuel can, tying rope, chocolates: picked up at Manali. 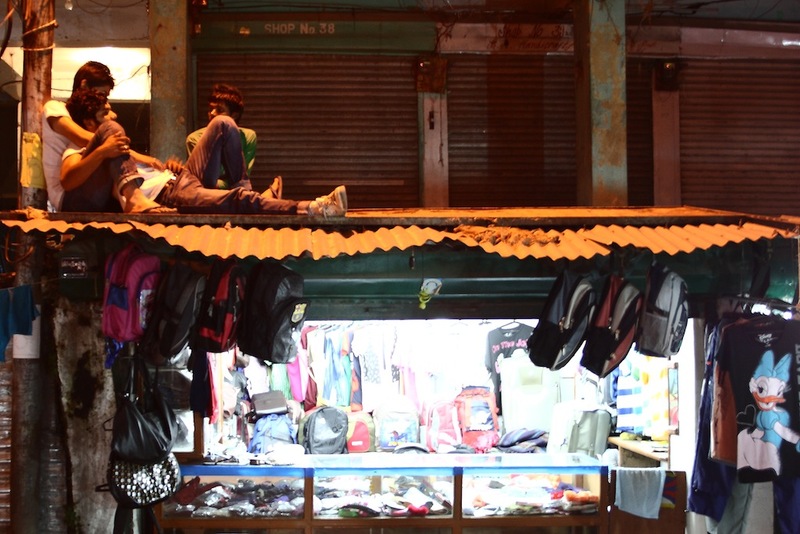 Manali also has good cheap shoes available, in case you want to use one just for this trip. For the photography enthusiasts, we had borrowed and bought among ourselves a wide angle lens, CPL and UV filters, and a car 12V inverter to charge the batteries (Belkin AC Anywhere). We had booked an early morning flight to Delhi, to give ample buffer time for our evening bus to Manali. The flight was in fact delayed by 3hrs, but we only had to give up the fun and merrymaking planned at Delhi. The new and renovated Bangalore and Delhi airports were relaxing. 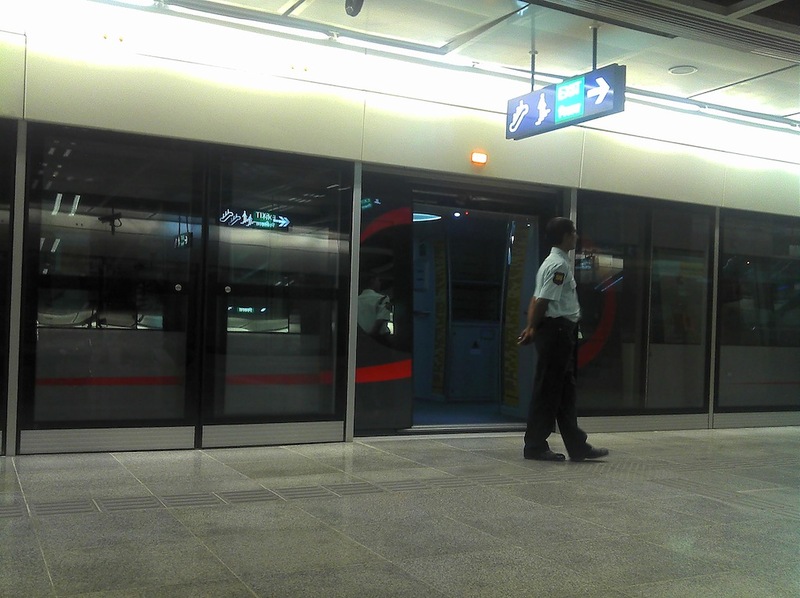 Delhi metro was great, it took us directly from the airport to Connaught Place from where the bus was starting in just 15 mins. The bus was bad - never book buses from Heera Himachal Holidays. It was noisy, the AC was almost not working and water leaked from the AC vents. The bus stopped once in the night for food at a dhaba (delicious chicken dish and roti), and once more in the morning for tea (scenic place, dirty toilets). Left: Auto ride to bus pickup point. 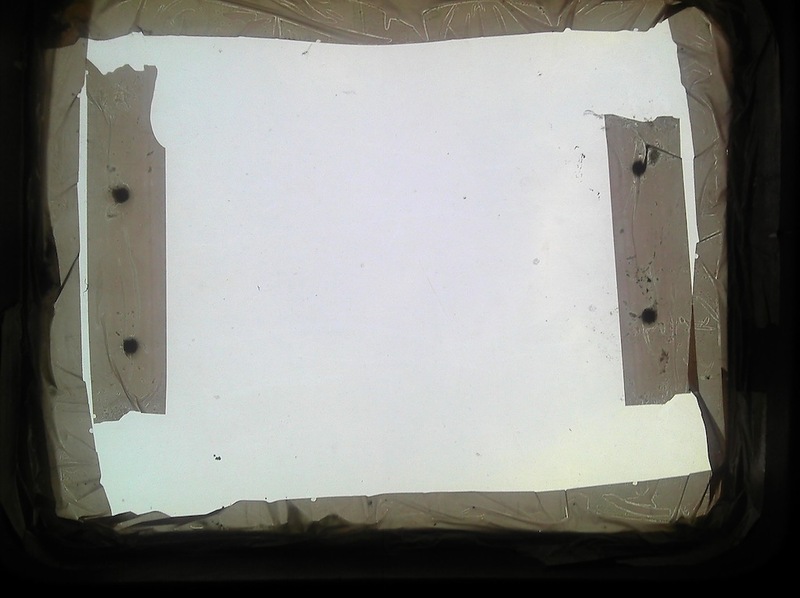 Right: Patched up roof of our bus. For watching the stars in the night. They know you won't get any sleep. 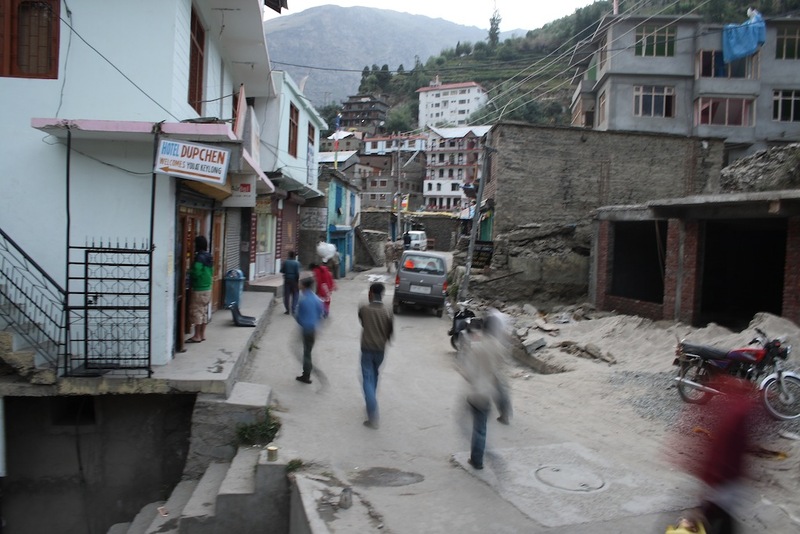 When we reached Manali in the morning, we were surrounded by touts offering us hotel stay. 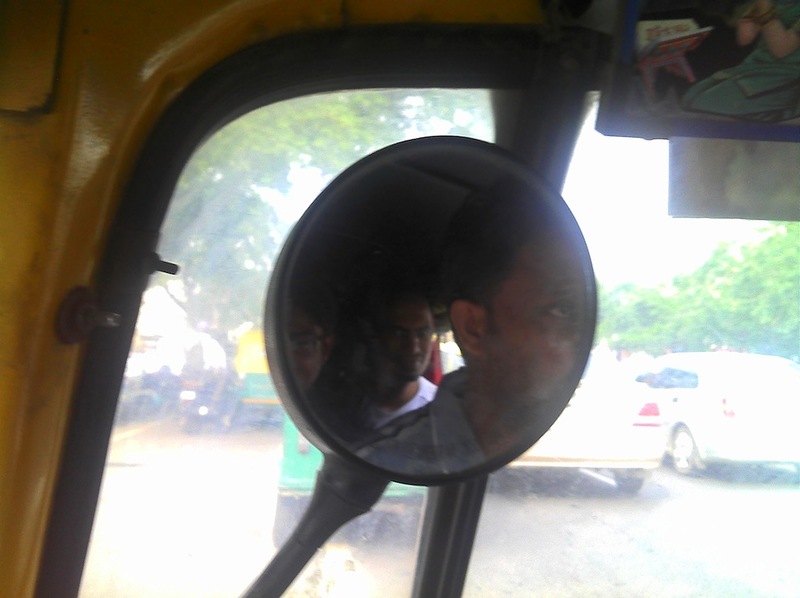 After rejecting a few nearby unreasonably expensive hotels, we were finally taken by a tout with a taxi to a hotel at Mall Road. It was near to the market place and the bike rental which fitted our requirement. After a heavy brunch, we headed towards the bike rental to take a look at the bikes. They were still preparing the bikes, so we were to come back in the evening to pick them up. We spent the rest of the day purchasing stuff in the market. Late evening was when we finally signed the papers and took the bikes. Filled them up at a nearby petrol bunk before going for dinner and bed. 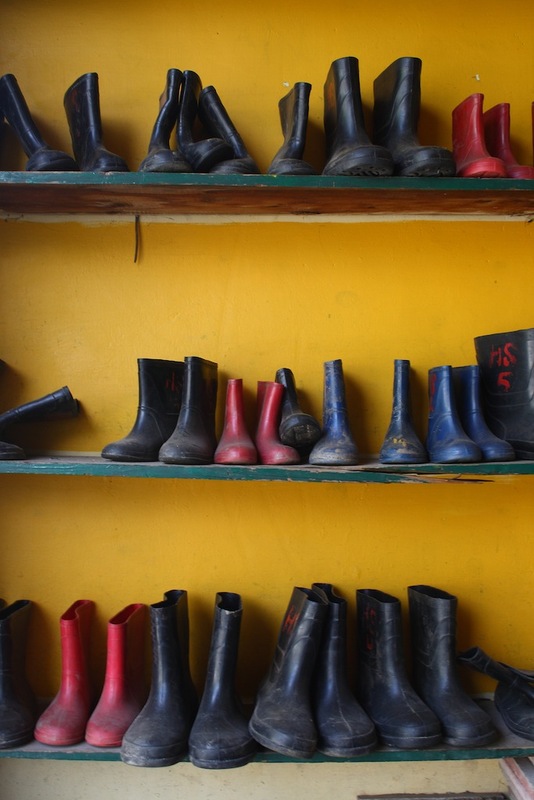 Left: Shoes on hire at a shop. With an early breakfast of bread omelet and tea from the push cart vendor in front of our hotel, we set off for our first destination - Keylong, via our first exciting ride over Rothang Pass. Some of us who didn't had breakfast had it at a place on the way. 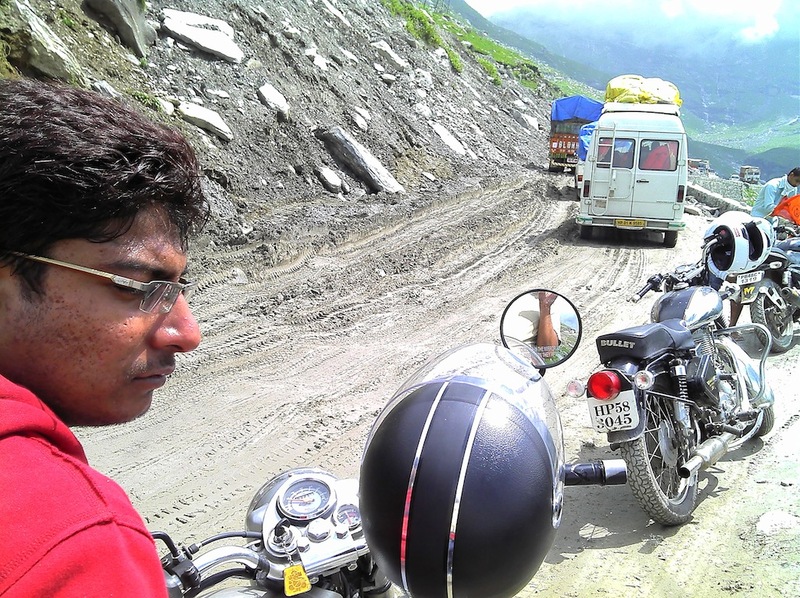 The initial stretch of the journey was smooth, till we encountered a mile long traffic jam before Rothang Pass. The jam was also an opportunity to socialize, after all, all of us there had the same destination and the same worries. We met a troupe of Mahindra Scorpios participating in an expedition till Srinagar, and a couple of bikers from Israel and an army convoy passing through who called their headquarters asking not to send any more vehicles for the day. We on the bikes could squeeze past the four wheelers easily. Further up the road began to take the form of wet slush. The only hope of crossing such stretches was to ride on the tire tracks of trucks passing by ahead, sometimes more than a feet deep. In spite of that, the ride was not easy. Clutch plates often became hot and the bike would refuse to pull. The only option then was to push the bike to the side and wait till things cooled down. After a grueling hour or so in the mud and slush we finally hit dry road with occasional ice walls flanking the road side just before the peak. Left: A relatively better section of the road to Rothang Pass. Right: Occasional ice walls by the road side. I must mention this thing I discovered about riding this day - the bonding between the rider and the bike. None of the bikes we had picked up were in real great shape. But once we rode them through such roads, each of us always felt most comfortable with the bike we chose in the first place. Of course there were the infrequent easy-road riders for whom the bike didn't matter. But once you cross a difficult terrain with a bike, you become so acquainted with its nuances that for the next difficult terrain you feel most comfortable with the same bike. It becomes somewhat like the wife. 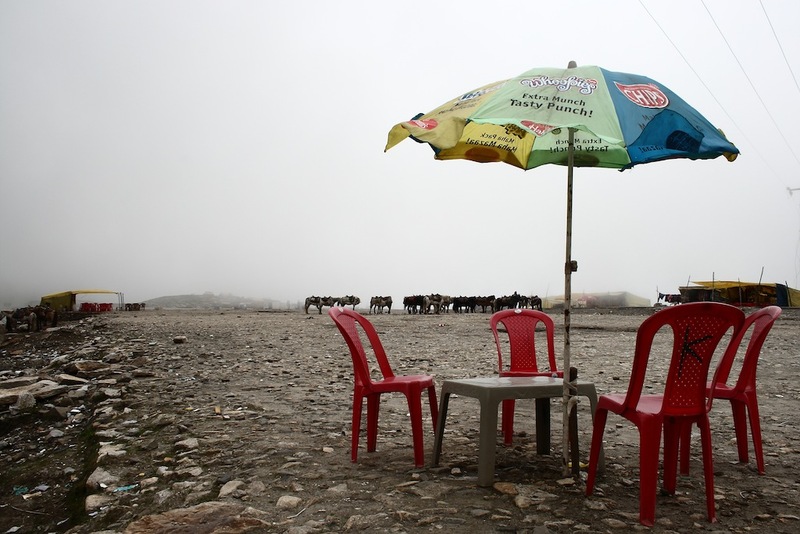 Anyway, the flat top of Rothang Pass had many shops serving instant noodles and tea. There were horse rides, mostly from tourists from Manali who came to visit just the Rothang Pass. We had a relaxing wait there sipping tea and sharing few noodle dishes amongst us while we waited for our cab to appear. The remaining journey till Keylong was fast and easy. It pales so much in comparison to Rothang Pass that I don't seem to remember much of it now even if I make conscious effort to recollect. I remember having stopped at a place on the way where food was available - rice, dal and egg omelet. 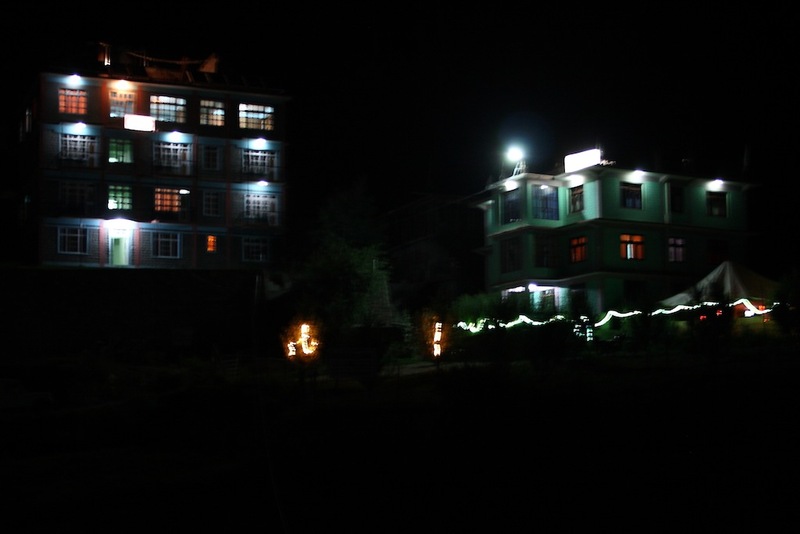 We reached Keylong well before the evening and checked in to one of the guest houses right next to the bus stand. It was a new construction, clean, comfortable and reasonably priced. We did not get a chance to spend a day at Manali to acclimatize ourselves to the heights because Rothang Pass closes every Tuesday for road repairs. We would have had to spend 2 days if we had waited. 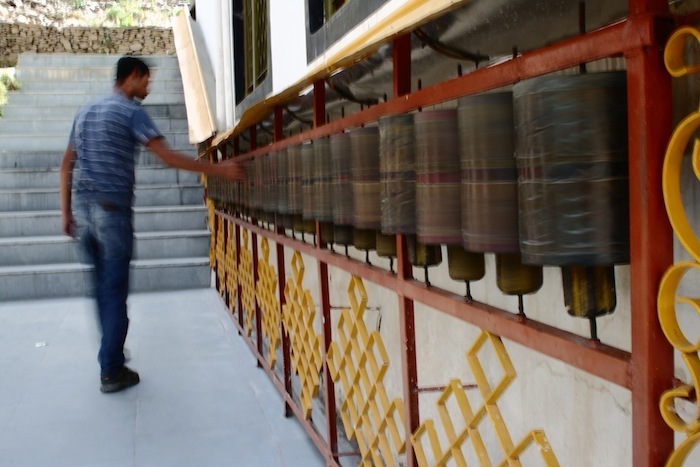 Instead we started a day earlier from Manali and decided to spend a day at Keylong before proceeding further. Keylong, though looks and feels dull is in fact a pretty important place. 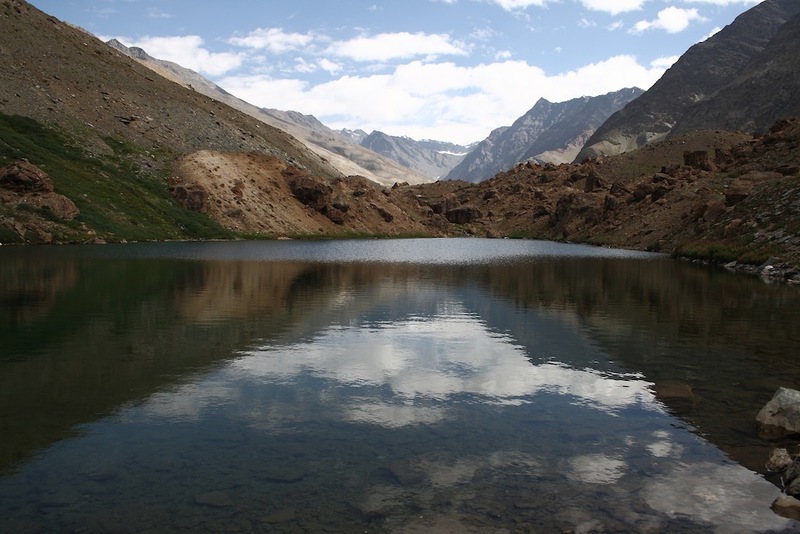 It is the administrative capital of Lahaul and Spiti districts of Himachal Pradesh. The famous Kardang Monastry is nearby and so is the confluence of the rivers Chandra and Bhaga forming the Chandrabhaga river while ultimately becomes the more well known Chenab river further down. Keylong main market (left). A snacks shop at the market (right). During our stay at Keylong we visited the Kardang Monastry, Chandra and Bhaga confluence at Tandi and had the opportunity to watch a local function being held by the townsfolk in honor of monks of nearby districts who had arrived to attend a Buddhist religious conference. We also visited the local hospital as one of us got some altitude sickness. That's when we discovered that the town did not have a single medicine shop; their only source of medicines and treatment is the single government run hospital in the town! The night sky from Keylong was so clear that we could watch the milky way, something that's not visible from cities any more. After a day a Keylong we started for Sarchu, our next destination. On the way we passed through Jispa. 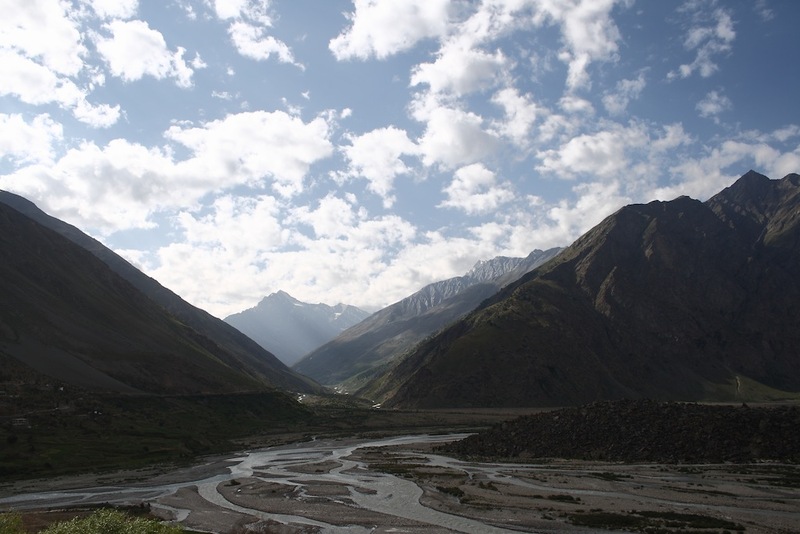 It was an awesomely beautiful valley just about 30km from Keylong. 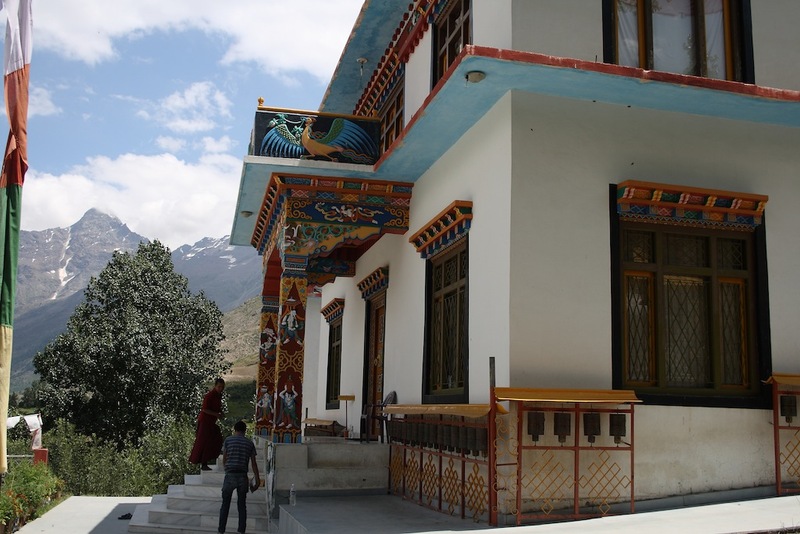 If you prefer to stay amidst nature rather than people, then book your stay at Jispa instead of Keylong. 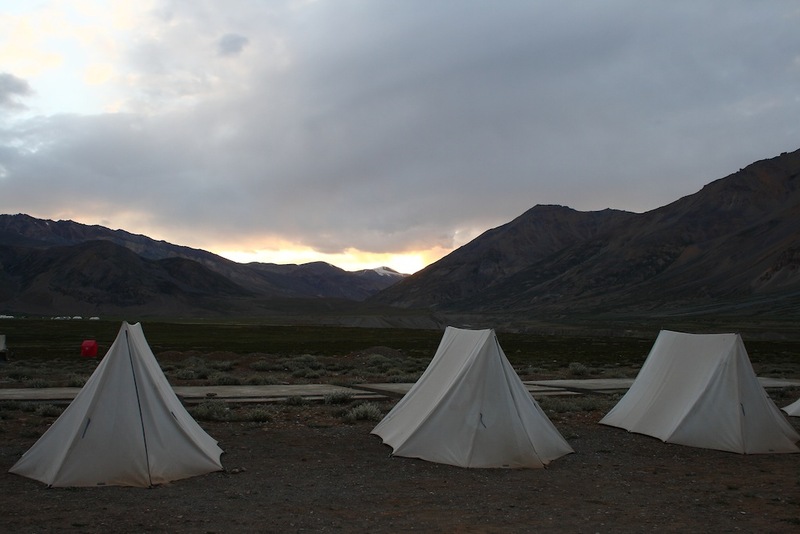 I mention booking because I could see only one hotel at Jispa, and only a few tents. We had our breakfast a short while after crossing Jispa. On the way we crossed two beautiful lakes - Deepak Taal and Suraj Taal. Crystal clear water with blue and green reflections of the sky looked beautiful. The mountains were amazingly multi-colored and scenic. We also had to cross a powerful stream of water flowing right across the road. This stream was much talked about by people, who had said that it becomes difficult to cross in the afternoon when more of the ice starts melting up the mountains. Luckily for us it was not that bad, and we also saw a bridge being built alongside. Hopefully by next season the bridge will be installed and a major hurdle will be gone. Not many people go beyond Keylong, and roads are mostly empty after that till Leh. 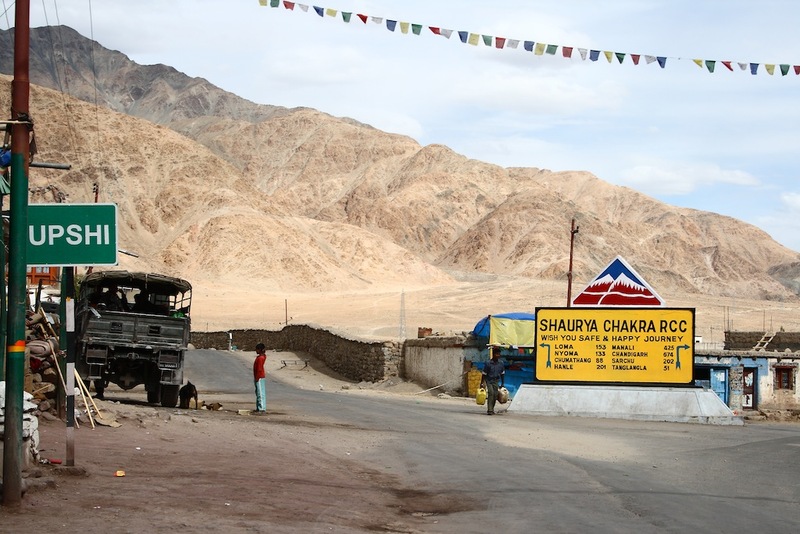 There's no habitation also till around 80 km from Leh. 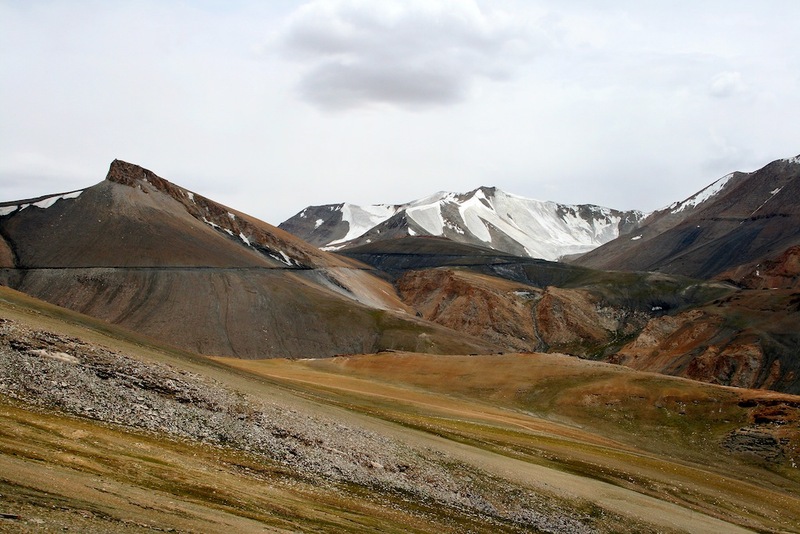 Sarchu is just a plain area with no permanent habitation. You can only find tents for hire by the roadside managed by a few enterprising guys. We picked up one such place to stay at Rs.150 per head. They also provide simple food (rice, dal and one vegetable curry) at additional charge. And yes, no telephone or mobile signals till Leh. Mountain sickness caught me at this place. It is a strange irritating feeling. On top of it I had a bit of stomach ulcer, probably because of not having enough water during the last leg of the journey. It lasted through the night, and I was ok by the morning. 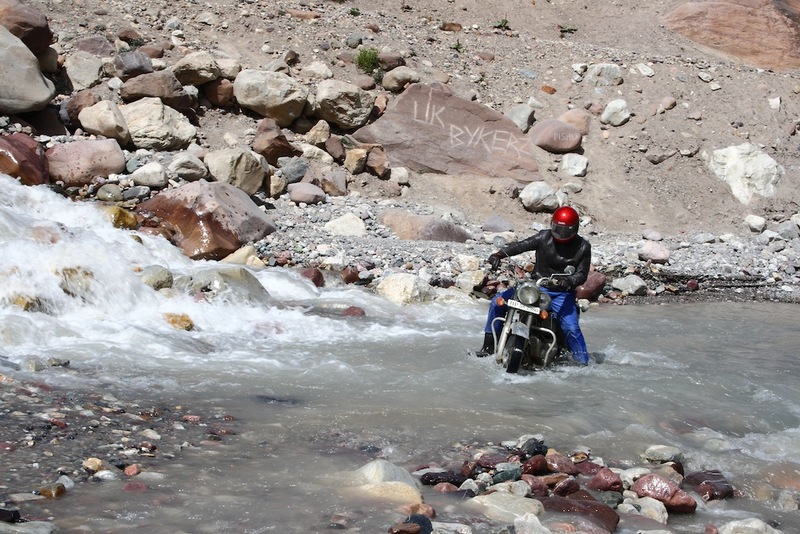 The other option nearby was Pang - further 80km towards Leh. But Pang is supposedly worse than Sarchu for mountain sickness. The bikes received a bit of attention at this place - one of them getting its clutch plates replaced. But overall the bikes were trouble free. The evening at Sarchu was beautiful with the sky turning red with the setting sun. It was interesting to watching the last direct rays of the setting sun slowly edging up the mountain peaks before disappearing leaving everything in a dull shadow. 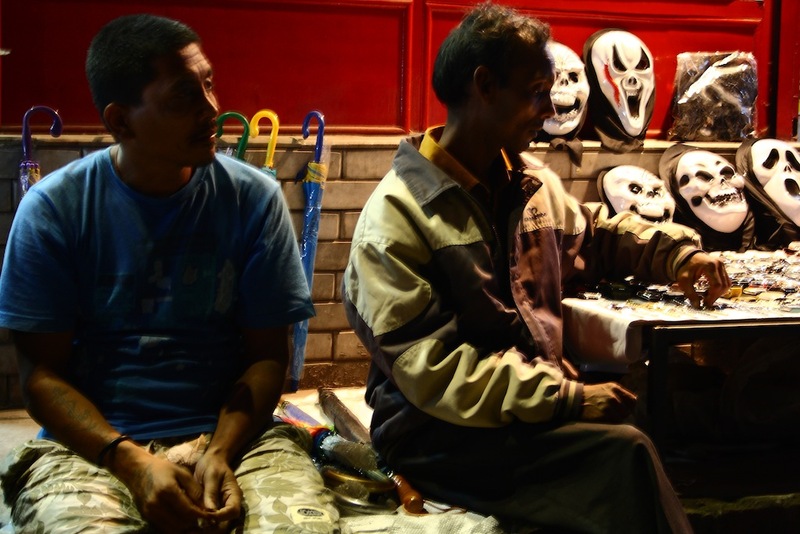 The night was cold and we all slept with our shoes, gloves and jackets on. 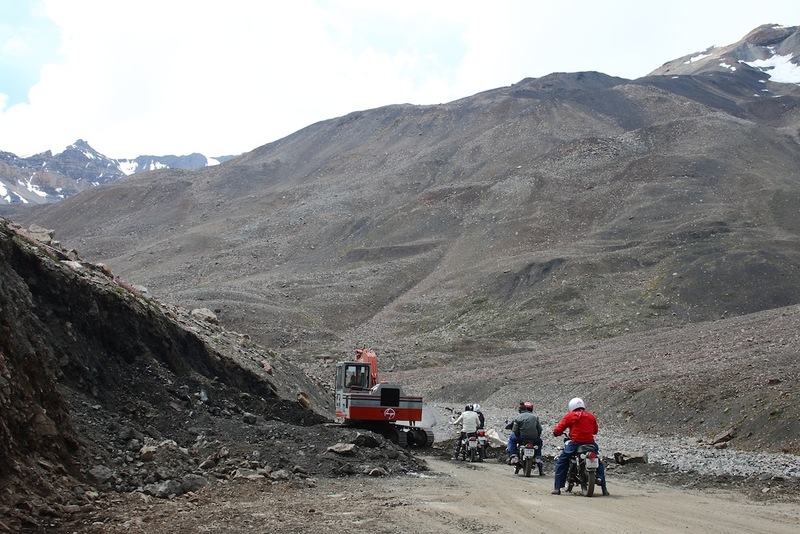 The next day was our longest ride from Sarchu to Leh. This leg of the journey was again like the first day. We crossed the Gata Loops - dusty and gravel road with 21 steep loops, two passes - Nakee La and Lachung La, many streams, Moore plains with portions of awesome road and a kilometer or more of of knee deep loose dust. The mountains and skies were stunning, but the road demanded attention. Seeing the occasional speck of a vehicle ahead climbing atop a far away mountain reminds you of the distance and the road ahead. I do not have words enough to explain the emotions. 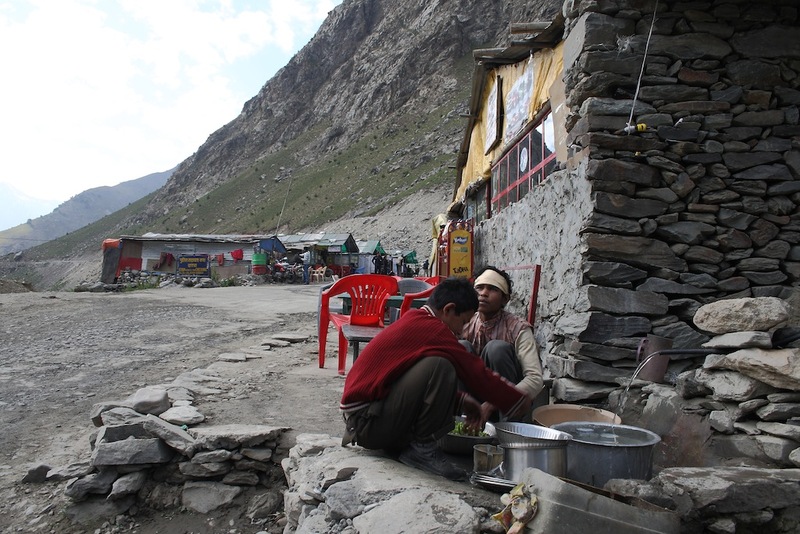 We had food at Upshi, around 200km from Sarchu and 80km from Leh. 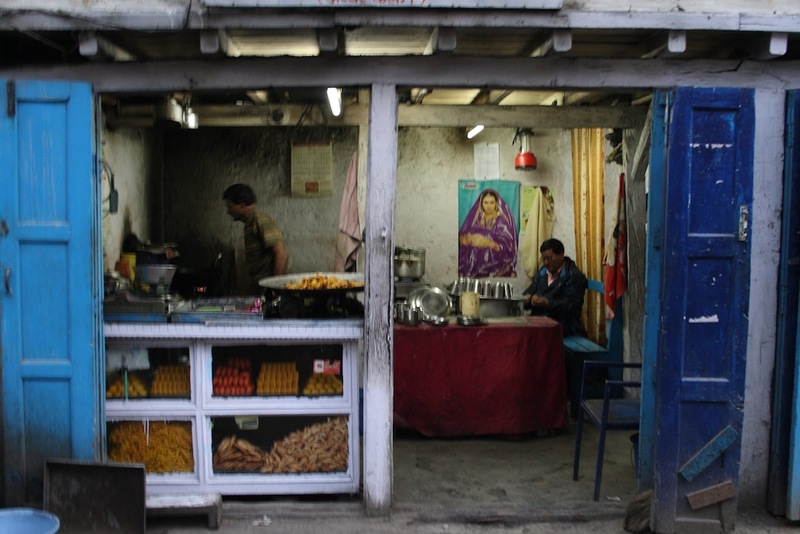 Upshi had a good number of dhabas serving Tibetan, Chinese and Indian cuisine - simple but tasty. After reaching Leh, searching for a guest house took us some time. The hotels near the main market are very expensive. We found a decent clean and simple place at Fort Road. Little inside and away from the hustle bustle of the market, but at walkable distance from it in case we needed something. With the back breaking but enjoyable ride over, all of us were left with a mixed bag of feelings - sad that the best part of the trip is probably over, but at the same time eager to see what lies in the days ahead. Some of us on our bikes. 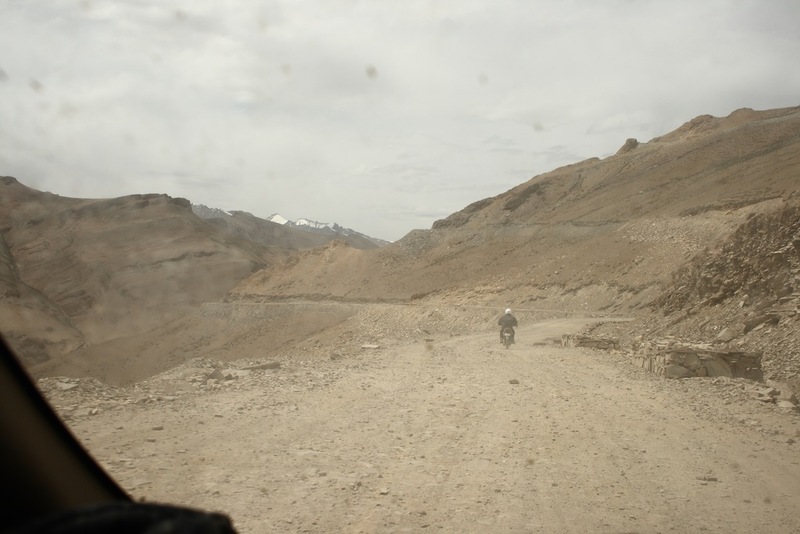 Nice travelogue Tanmay, one that I'm sure will inspire a lot of people to ride to Ladakh. 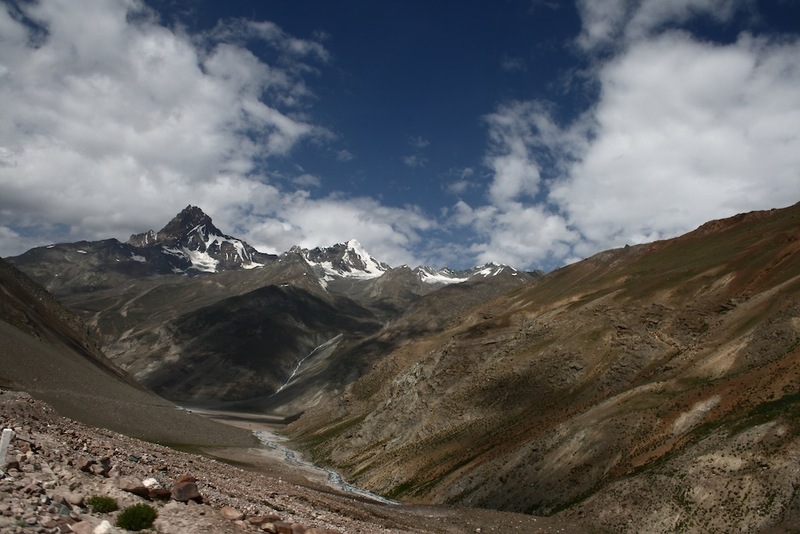 Now you must do the Spiti ride! Nice account of your journey Tanmay. @Harsh You bet! This place is addictive! @Dheeraj Thanks for the encouragement! Lovely pictures, made me want to go back there :) ... I think that ice wall could be Rani Nala. Awesome experience, it must have been!! Lovely blog! @Indian Home Maker: Yes, that is Rani Nala. Thanks! Tanmay - a very useful and must say godsend post for me. Planning a trip next year june/ july - not decided if wanted to do a road trip or fly (chickening out). Having read this looks like road it will be. Great post man, one of the best i have read. Look forwarding to getting in touch with you soon to get more details. thanks man and also thanks for following on my blog. @Mayank Road trip is definitely much more exciting and beautiful. Good luck on your planning. And thanks for tweeting this. BTW, you have just awesome photographs on you blog! We contacted a bike rental agency. These are the charges he's quoting for a one-way trip from Manali to Leh (one-way). So to return the bikes, we'll have to pay Rs.5000 + Rs.1200 per bike. Is this reasonable rate? I'm ok with Rs.5000 but they are charging us again for the petrol !!! 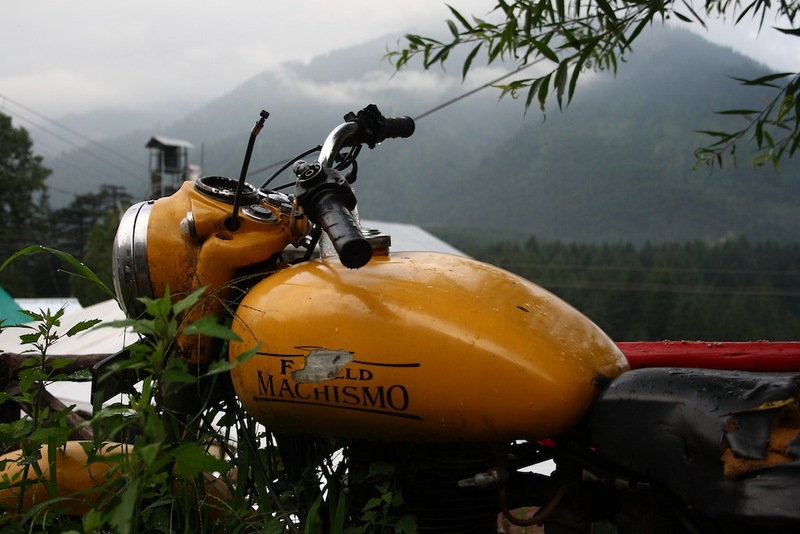 We would be hiring bikes at Manali to Leh (one-way). The agency is charging us Rs.5000/bike for the return transport and an additional Rs.1200/bike for the petrol. I am ok with Rs.5000 after reading your post, but do they usually charge for the petrol too?? Hi Krishna. Yes they seem to have hiked their charges. 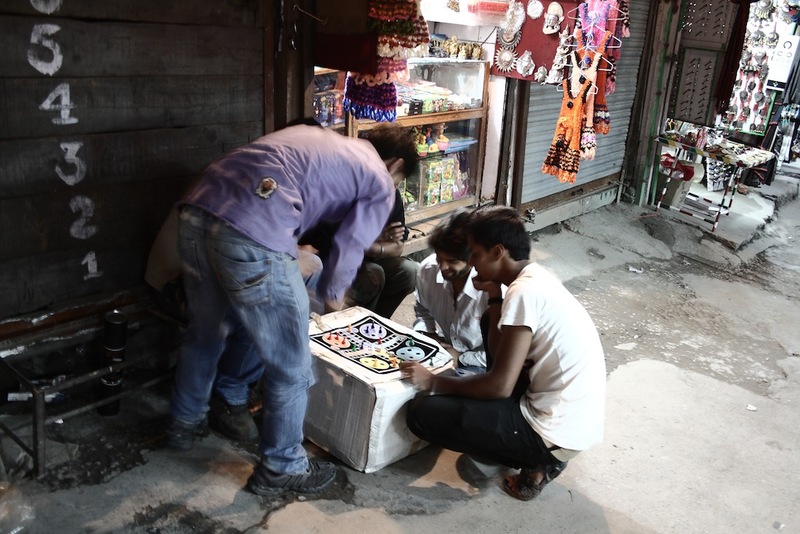 But the price of 5000 we had got was after lot of bargaining. (days to bring bikes back) * ((daily bike rental) + (daily mechanic charge)) + (petrol cost). This of course includes their profit, but if the bike was not with you, they would have been rented out at these rates. If you are going during the off peak season or hiring a good number of bikes, you should bargain hard or talk to some other rental agency. But focus on getting good bikes so that you enjoy the ride better with minimal breakdowns/problems. All the best. And do let us know how the ride went! Thank you for your inspiring blog and totally awesome photos and writing style. 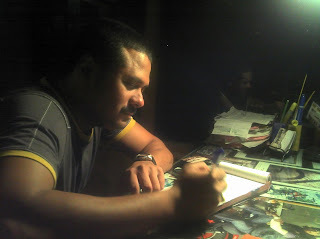 I'm an Indian expat living in New Zealand. 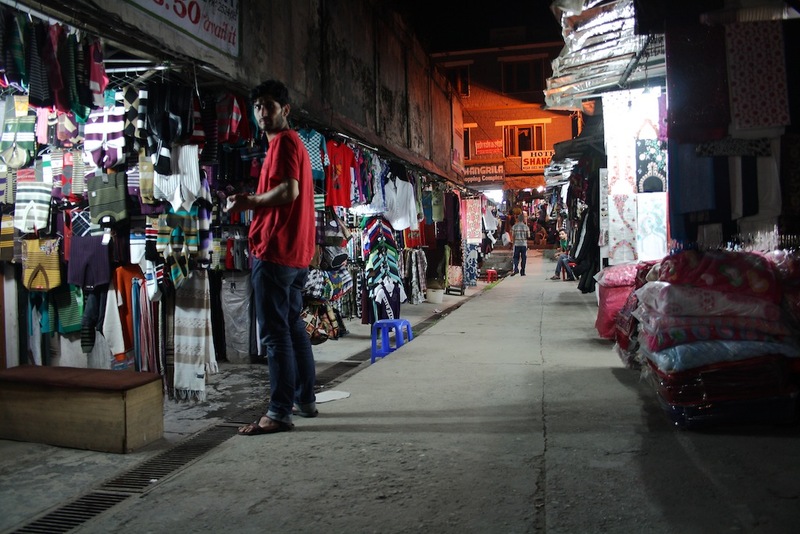 Your blog has motivated me to do more travelling in Bhutan, Ladakh and Waynad. Was in Kashmir, 1993, but didn't make it to Ladakh. Thanks again! Useful information. Thanks for writing. I like your blog. It is very understandable and useful information with wonderful images. You will find plenty of hotels in Srinagar with rates. You will cherish each and every moment in this city. 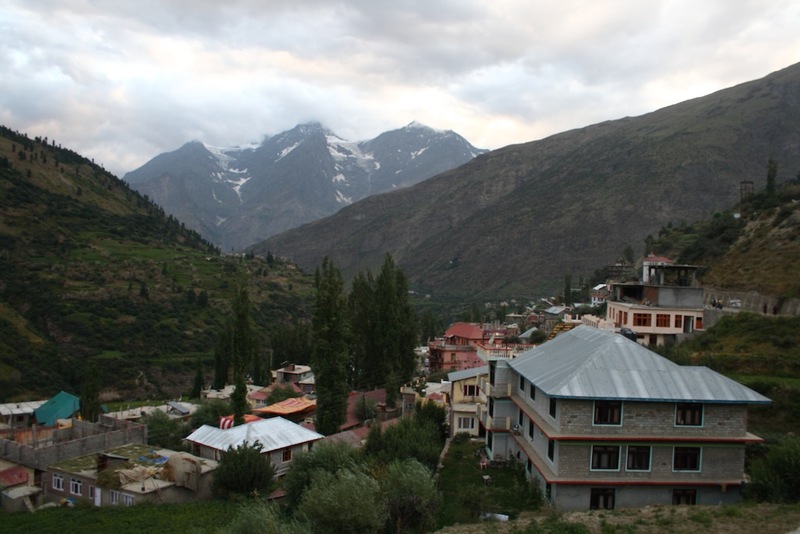 Thanks for sharing information… keep updated…Manali Tour Package. Hotel, Sightseeing, Food at affordable price. Call us 8826410377 book your package.